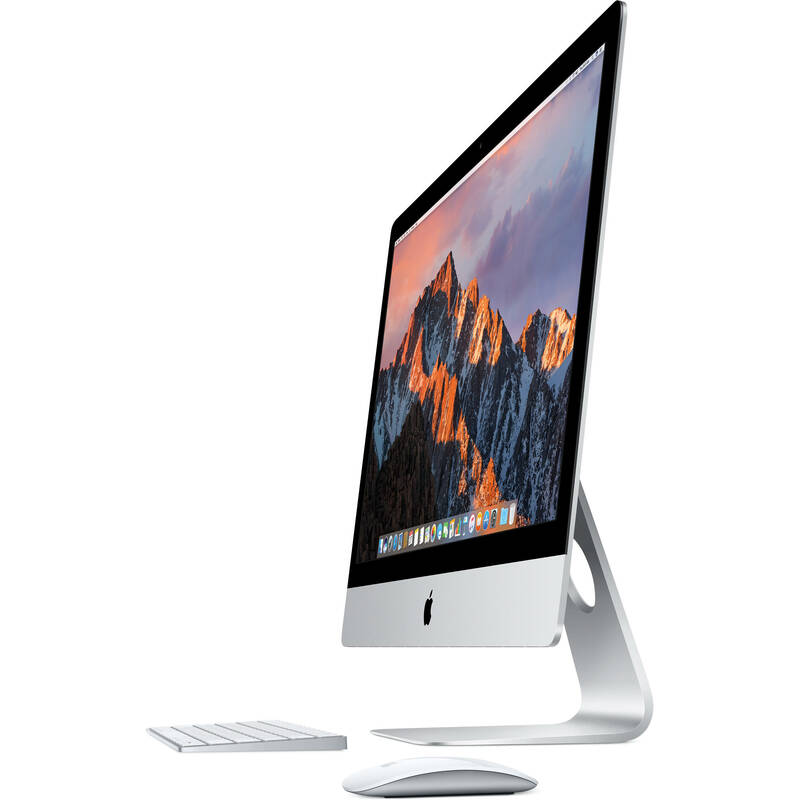 The iMac's processor has been upgraded and now houses a 7th-gen Kaby Lake 3.4 GHz Intel Core i5 Quad-Core processor that can be overclocked up to 3.8 GHz, as well as 16GB of 2400 MHz DDR4 RAM. Visuals are powered by a dedicated AMD Radeon Pro 570 graphics card with 4GB of vRAM, and for storage, there is a 2TB Fusion Drive. Apple's 27" iMac with Retina 5K Display (Mid 2017) operates using 100-240 VAC at 50-60 Hz and includes an Apple Magic Wireless Keyboard with Numeric Keypad, an Apple Magic Mouse 2, a Lightning to USB cable, and a power cord. Protection is provided by a limited 1-year warranty, which can be extended using AppleCare. Two Thunderbolt 3 (USB Type-C) ports come standard on all iMac models, each delivering up data transfer speeds of up to 40 Gb/s for external drives and cameras, plus twice the bandwidth for video and display connectivity. Thunderbolt 3 also supports 10 Gb/s USB 3.1 and DisplayPort 1.2. Thunderbolt 2, HDMI, DVI, and VGA output is also supported using adapters (sold separately). Box Dimensions (LxWxH) 32.5 x 24.5 x 10.0"